Root is one of the fundamental concepts for Android, right from the inception of the operating system, to the point where it has today become the leading smartphone platform, evolving far beyond it was when it started. When it was started, gaining root access on Android wasn’t as simple as it has become today, and much credit for that goes to the Superuser apps developed by ChainsDD, and then the SuperSU by Chainfire. 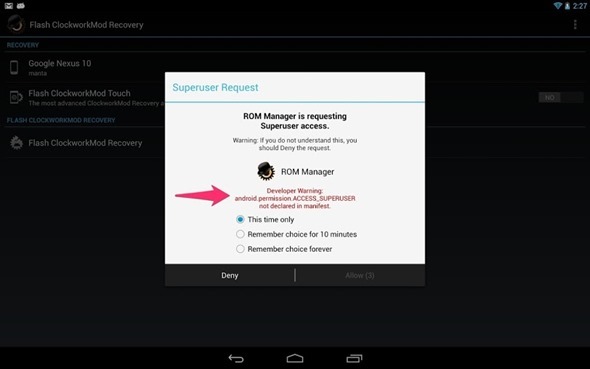 Both these apps have made it “super” easy to get Superuser access, but that, too, is dependent on a custom recovery. And when it comes to custom recoveries, nothing could perhaps ever gain as much popularity as Koush’s ClockworkMod. * Superuser should be open source. It’s the gateway to root on your device. It must be open for independent security analysis. Obscurity (closed source) is not security. * I want to be able to point users of my app to a Superuser solution that I wrote, that I know works, and that I can fix if something is wrong. Yes, this is selfish: Carbon does not work with some versions of Chainsdd’s Superuser. SuperSU works great, but I am not comfortable pointing a user to a closed source su implementation. It makes sense that an app such as Superuser should be open-source, and so, the source code for ClockworkMod Superuser is available to all for inspection at Koush’s github. His point of multiuser support for Android 4.2 and above is moot now, considering that the original Superuser app has also started delivering that, albeit very recently. The good part is that this Superuser app will remain fully free, always, and will not follow the traditional pattern of Koush’s other apps with a “premium”, more feature-rich version. The app is due to be available at Play Store really soon, although for now, it’s only being distributed through Koush’s own channels. You may want to check out his official Google+ post for further details, linked at the source below.